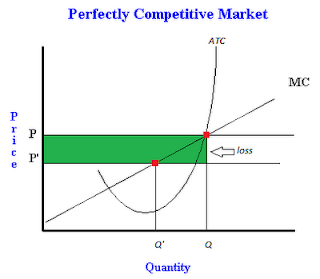 A perfectly competitive firm losing money, a graphical example - FreeEconHelp.com, Learning Economics... Solved! This post will go over the economic concept of perfect competition. The question asks about one firm in a perfectly competitive market, and how a competitor’s price change will affect their own profits. i) Using your knowledge of the assumptions associated with a perfectly competitive market, list and explain one reason why Laura does not get to decide how much she will charge her customers for a box of cookies. ii) Because Laura will always attempt to maximize profits, at what level will she produce? iii) Please show ALL of the effects with graphs on the Girl Scout cookie market of a decline in price for Boy Scout Popcorn (a substitute for Girl Scout Cookies). Assume Laura’s firm will not need to shut down. Please label the resulting profit or loss. In a perfectly competitive market, there are so many buyers and sellers in the market that no one seller or buyer can influence the price in the market. Firms are said to be “price takers”. For example, if there was only one seller, or a few sellers, then they could meet and decide to manipulate the price probably increasing it. Also, if there were only a few buyers, they could refuse to buy the product unless the price was dropped. But in a perfectly competitive market, there are so many buyers and sellers of a product that no one firm can manipulate the price. If she tries to then consumers will just buy from someone else until the firm switches their price back to the market price. You can see that the price determined in the market (on the left graph) determines what price level will be received by the individual firm (on the right graph). If Laura is trying to maximize her profits, then she will always produce at the point where marginal cost is equal to price/marginal revenue (another way to think about it is marginal cost being equal to marginal benefit). If the price of Boy Scout popcorn goes up, then demand for Girl Scout cookies will go down. This is because the two goods are a substitute (see reasons for why the demand curve will shift). Demand decreasing (or shifting left) causes equilibrium price and quantity to fall in a market. The resulting decrease in price will cause all firms in this market to decrease their own production, in order to get marginal cost equal to price again. The green area shows the loss that the firm now faces due to lower prices. Note that the firm is still producing at quantity Q, even though it should now be producing at point Q’. The reason the firm is incurring a loss is because the average total cost of the product is P (at point Q) which is higher than the price received of P’. Since this area is a rectangle, we can find the total loss by multiplying the difference in P and P’ by Q. So having a competitor lower their price is not a good thing. It will either result in you producing less goods for your firm, or possibly making a loss on your products. Good video but the diagram leaves a lot to be desired!